There are a few things you need to decide, and info you need to have on hand, before moving your business to Office 365. A. List of people you want to add to Office 365. 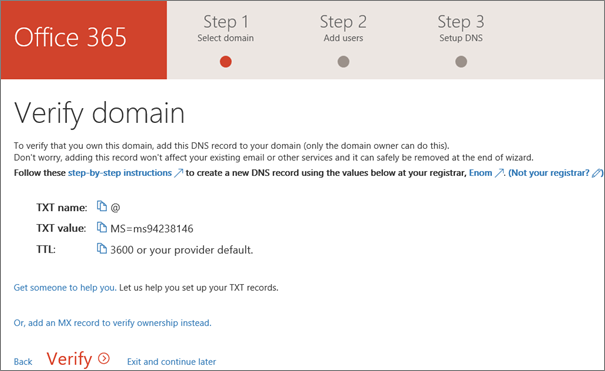 Even if you’ve already added them to Office 365, if you’re updating your domain information, you need to enter their names here. B. How you’re going to notify your employees of their Office 365 user ID and password so they can sign in. Are you going to call them with the info? Or send it to their personal email address? They won’t have access to their Office 365 email, so you can’t use that. C. If you have a domain name for your business (such as contoso.com) and you plan on using Office 365 email, you’ll need to know where your domain is registered and have sign-on information. 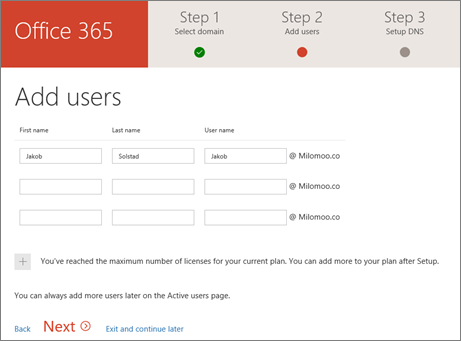 Add your domain, such as contoso.com.When you signed up for Office 365, you got a user ID that includes an “onmicrosoft.com” domain. In this step, you can add your own domain so your user ID and email are personalized for your business, like rob@contoso.com. Domain setup can be confusing, but we’ll guide you through it step by step. What’s a domain? Verify your domain. In this step, the wizard gives you a code - called a TXT value - that you enter at your domain registrar. If your registrar is GoDaddy, the wizard prompts you to login in at GoDaddy so Office 365 can enter the code for you! Add your users. You can add users later, too; see Add users individually or in bulk. Note: If you need to assign admin permissions to the users you add in the wizard, you can do that later on the Users page. Migrate email and contacts from another email service that uses IMAP (such as Gmail). For more migration options, or if you just want to migrate your email later, see Migrate email and contacts to Office 365. Setup online services, such as email and Skype for Business. Change your nameservers. (You don’t have to do this step if your domain registrar is GoDaddy.) IMPORTANT: After you do this step, your user’s email will be delivered to their Office 365 mailbox. It may take up to 72 hours for your domain provider to start rerouting email. Now you can go to the Office 365 admin center, where you can change the domain of your Office 365 admin account. Plus you can manage your billing information, add or remove users, reset passwords, and do other business functions. Note: You can also update your account to the new domain on the Users page. If you get stuck at any point, call us. We’re here to help! There are a couple of scenarios that include either migrating data or users from on-premises environments, or setting up a hybrid system that includes directory synchronization. If you are in this category, follow the instructions in these articles. To set up directory synchronization with your on-premises Active Directory, see Set up directory synchronization in Office 365, and to understand the different identity models in Office 365, read Understanding Office 365 Identity and Azure Active Directory. To set up a SharePoint hybrid, particularly hybrid search and site features, see Hybrid Search in SharePoint. Do you want someone to help you set up Office 365? Ask for help by filling out the form below and we will call you. Consider hiring a Microsoft partner. If you’re short on time, or have advanced requirements (like moving thousands of files to Office 365 cloud storage or integrating with other software), an experienced partner can be a big help. a. Add your employees to Office 365 so they can download and install the Office apps. b. Download and install the Office apps to use Word, Excel, and PowerPoint on your computer and devices. c. Install Skype for Business to use for your meetings. d. Move your content to Office 365 cloud storage (OneDrive or team sites). 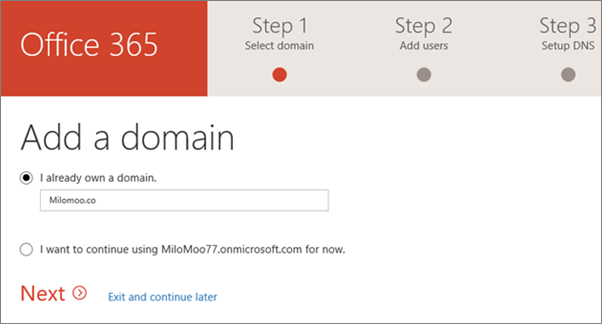 e. And, when you’re ready, run the Office 365 setup wizard to move your domain and email. Each person in your business can install the Office 2016 suite of apps (Word, Excel, PowerPoint, and so on) on up to 5 PCs and Macs. See the operating system and computer requirements for installing Office 2016 suites for business. Office 365 mobile apps can be installed on iOS, Android, and Windows devices. You can find information on mobile device and browser support in System requirements for Office. If you’re planning to move from an existing email service to Office 365, it usually takes 2 days to make the switch. To move your business email address (such as rob@contoso.com) from another email service to Office 365, you need to direct your mail to be delivered to your new Office 365 mailbox. You do this using the Office 365 setup wizard, where we guide you through the updates you need to make at your domain host, step by step. After you update your domain host, the changes typically take effect in just an hour or two. But be aware that it can sometimes take up to 72 hours for the changes update across the Internet. Because you might have email downtime, we recommend you plan to switch to Office 365 email during an evening or weekend when you receive fewer emails. If you don’t want to use the setup wizard to migrate the mailboxes, you can let mailbox owners migrate their own email and contacts. See Migrate email and contacts to Office 365 for business. If you are migrating from Gmail, see Migrate Google Apps mailboxes to Office 365. 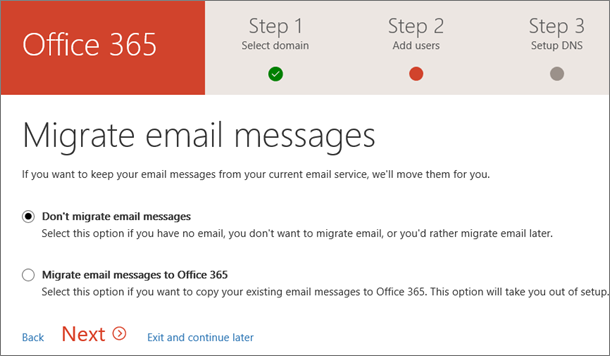 If you are migrating from another email provider, including Exchange, see Ways to migrate multiple email accounts to Office 365. Office 365 provides cloud storage for individuals, small businesses, and enterprises. For guidance about what to store where, see Where you can store documents in Office 365. You can move hundreds files to OneDrive or to an Office 365team site. You can upload 100 files at a time. Avoid uploading files larger than 2GB, which is the maximum file size by default. If you want to move several thousand files to Office 365 storage, review the SharePoint Online Limits. We recommend that you use a migration tool or consider hiring a partner to help you with the migration. For information about how to migrate a large number of files, see SharePoint Online and OneDrive Migration User Guide. If you have Office 365 Business Premium or Business Essentials, you can use Skype for Business to make calls to other people in your business who are on your subscription. For example, if your business has 10 people, you can call and IM each other using Skype for Business without any special setup. Option 1. Use the free Skype app. If you have a very small business (for example, 1-2 people) using the Skype app is the better way to go. It’s less expensive to use for domestic and international calls. You can still hold conference calls, make video calls, and share your desktop for presentations. Check out the rates and payment options. Note that the Skype app isn’t part of the Office 365 suite, so it won’t be integrated with Outlook 2016 the way Skype for Business is. This means your contacts in Outlook 2016 won’t show up in Skype; you’ll need to add your contacts to Skype. We recommend starting with the Skype app to see if it meets your needs. If it doesn’t, then consider the next option, to upgrade your plan. Option 2. Upgrade your plan, and buy Cloud PBX and the PSTN Calling plan. Buy the E1 plan if you don’t want to receive voicemail. Buy the E3 plan if you do want to receive voicemail. Here’s how Cloud PBX voicemail works: When a user receives a voicemail, it will be delivered to their mailbox as an email with the voicemail message as an attachment. They can also listen to their messages over their Skype certified desktop phone, all Skype for Business applications. Buy the Cloud PBX add-on. Buy a PSTN Calling plan: you can only buy this after you buy the Cloud PBX add-on. This second option is ideal for businesses with several people who make and receive external phone calls. There are other Skype for Business features you can add to your subscription, too. Do you want to use Skype Meeting Broadcast? Skype Meeting Broadcast is a feature that lets you produce, host, and broadcast meetings with up to 10,000 attendees. To learn more about how it works, see What is Skype Meeting Broadcast? To use Skype Meeting Broadcast, you need to enable it, configure your network, and schedule a practice meeting and have a user join it. By default, everyone in the world who uses Skype for Business will be able to contact you, assuming they know your email address, your firewall is configured to allow it, and they have open communication policies. If you want to allow your users to communicate with some businesses but not others, see Allow users to contact external Skype for Business users. Skype for Business and the free Skype app are two different services. You can give your users permissions to search for and IM with people who are using the free Skype app. To do this, see Let users add external contacts from Skype. The presence feature shows who’s online and what their availability is, such as available, busy, away, or presenting. You can choose the default settings for everyone in your business. For instructions, see Configure presence in Skype for Business Online. Do you want to integrate with your on-premises Active Directory? You can integrate your on-premises Active Directory with Office 365 by using Azure Active Directory Connect. 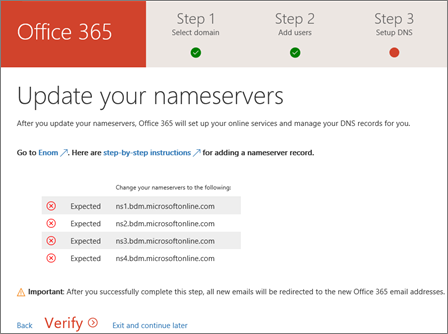 For instructions, see Set up directory synchronization in Office 365. Do you want to integrate Office 365 with software made by other companies? If you need to integrate Office 365 with other software in your business, we recommend you consider hiring a partner to help you with your deployment. Reach out to an expert now and we will get back to you shortly! Maureen Data Systems is a IT services and solutions company committed to developing custom, streamlined solutions for customers to achieve their business objectives. MDS structures its highly skilled engineers to align with how our customers consume technology—with one team responsible for infrastructure, another heading up productivity and applications, and a third committed to identity and security solutions. Download your MDS Line Card here.